Keyboard with digital touch timing. Six types of input analog signal, such as bipolarity of -10V- +10V. Display I, V, Frequency, etc. Use potentiometer, so easy to operate. Suitable for loading characteristics of such industrial machines as Conveyor, Extruder, Wood-working machine, and those machines that use pump, fan, and that need to regulate speed. 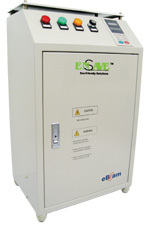 Energy Saving control, light-load/overload automatic electronic-saving. 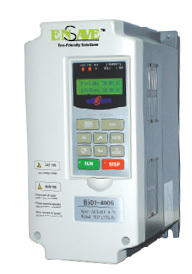 Memo bus control with RS485 communication. Auto-adjusting motor torque & motor protection. Full DC injection braking & integral dynamic brake. Program security lock & On-line programming. 15 preset V/F patterns and custom V/F pattern with/without voltage limit. Switchblade keyboard control or Terminal control or Series control. Soft-start characteristics & Torque detection & Frequency detection. All series with extended braking resistor terminals. It makes machine more reliable in high frequency switching RUN/STOP or High speed/Low speed situation. Built-in variable digital/analog input functions to suit a wide array of needs. Building interface circuits with external devices. Suitable for loading characteristics of such industrial machines as Conveyor, Extruder, Wood-working machine, Printing machine, Elevator, Textile machine, Bricks Making machine, and those machines that use pump, fan, and that need to regulate speed. High Power Saving. Advanced microcomputer control technology is adopted to evolve a constant flow pump into an energy saving changeable flow pump. With saving as much as 20% to 55%. High Return on Investment. All investment can be recouped resulting in the saving of power after one to two years. High Reliability. Leaving the control mode and the oil circuit of the injection moulding machine as they are before, the energy saving running control mode is adopted to prevent the production from being affected upon the fault. Soft start. Help to reduce the surge of power. Lessening mode-locked opening vibration, extending the service life of the equipment and the moulds. Easy Operation. 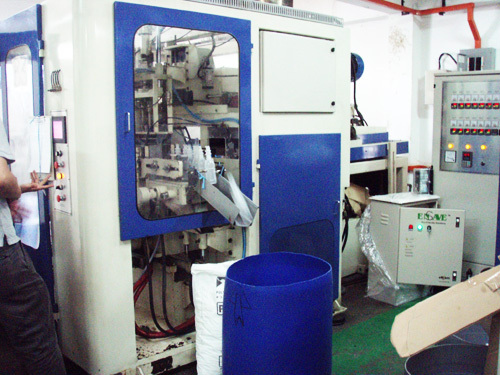 Can run with the injection machine synchronously without any adjustment. Applicable in Plastic Injection machinery and Extrusion machinery. To understand the saving principle of our Ensave system, it will be appropriate if we take an example of one of our customer air compressor’s data. The company's compressor pressure set to: maximum pressure of 0.8Mpa and the lower pressure of 0.53Mpa. For a unit load, the loading time and the unloading time are about 2 / 1. Part of the air compressor’s time works in the unloaded state with low efficiency, and power wastage. At this point the so-called unloading where the compressor is not acting, and in the empty state, and then this part of the energy is wasted. Another reason for the lower limit set at 0.53Mpa, that is the minimum 0.53Mpa gas can be used in production, and the pressure increases from 0.53Mpa to 0.8Mpa (loading) will result in a large wastage of electricity. With our Ensave air compressor dedicated Saver which uses a specially designed pressure control system which sets a reasonable supplies pressure, such as for this case 0.55Mpa. When the system pressure is higher than this pressure, Ensave Saver reduces the compressor’s speed, and then doubled down the compressor power consumption. When the gas consumption increases, Ensave Saver increases the compressor speed so causing rapid increases in pressure in a short-term. And so achieve two objectives: energy-saving and constant pressure air supply. Meanwhile, the compressor motor starting mode becomes soft starter, which in turn can protect the compressor and the motor, and greatly extended their service life. At present most of the usage (volume) of the air compressor systems for all production needs is set at the standard in the upper and lower limits. When start running, if the size of the load condition makes air compressors produce more unloading time, the greater the loading and unloading proportion, the more the energy is being wasted. And result in a significant waste of energy. Ensave air compressor energy saving intelligent controller is a highly intelligent integrated control system. The system comes in a control cabinet. The control unit corresponds to the specific size and power of the motor. Intelligent Control Unit: intelligent control unit is the core of the system. It takes a great deal of analysis, calculation and real-time control tasks. It collects the pressure from the pressure information acquisition unit, It conducts a comprehensive analysis and processing, in accordance with the mathematical model of optimal saving and energy saving operation to calculate the speed curve of the motor, and to control the motor speed operation to achieve energy saving. And be able to achieve the needs and requirement of the users to ensure safe, effective, reliable operation. Electromagnetic control unit: The system makes use of the electromagnetic voltage regulator, electromagnetic phase, electromagnetic balance technology, and combined with the microcomputer intelligent control circuit. It can monitor real-time changes in the electrical load in accordance with the actual parameters of the current grid and to match the actual needs of the output control power. Also, the excess energy can be feedback to the grid. This will improve the power factor of the electrical equipment, reduce line losses, improve system power efficiency, increase the line capacity, and improve voltage balancing. Furthermore, reduce the loss of the electrical device, and hence extend the electrical equipment life. Thus, effectively achieve comprehensive system energy-saving and a substantial increase in the power-saving efficiency. Inverter modules: The inverter modules control the running speed of the motor with the speed range from 0 to 100%, and the overload ratio of 120 to 150% (one minute duration). The operating frequency or speed signal of the inverter is governed by the intelligent control unit which automatically controls the speed in accordance with the speed - time curve of the motor. pressure sensor, responsible for the collection and transmission of pressure signal. Switching power supply: This device provides high-precision DC power supply to the power-saving controller, and to ensure stable and reliable operation of the control system. achieve a constant pressure to the whole system. Soft start to reduce the current and mechanical impact, extend equipment life, reduce equipment maintenance cost. Improve the system power factor, and power efficiency. No need special trained personal to take care, the system is stable, according to need the system will automatic exit. Ensave B500Y Series Smart Centralized Air-condition system is safe and reliable. It not only has overload protection, failure bypass protection function, but also stabilizes the voltage, suppress over-voltage fluctuation amplitude, reduce network losses, improve power factor, and improved power efficiency, which brought great convenience to the user. The operating principle of the water pump and fan of fluid transmission equipment is that, the flow (air quantity) of the water pump and fan is in direct proportion to their rotation speed. The pressure (head) of the water pump and fan is in direct proportion to the square of their rotation speed. 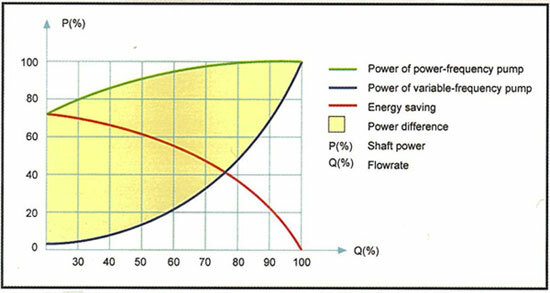 The shaft power of the water pump and fan is equal to the product of the flow and pressure, so the shaft power of the water pump and fan is in direct proportion to the cube of their rotation speed (that is, in direct proportion to the cube of the power frequency). Based on the above principle, if the rotation speed of the water pump and fan is reduced, the power of the water pump and fan can be reduced to a greater extent. For example, if the power frequency is reduced from 50Hz to 45Hz, P45/P50=(45/50)3=0.729. That is, P45=0.729P50 (P stands for the shaft power of the motor); if the power frequency is reduced from 50Hz to 40Hz, P40/P50=(40/50)3=0.512, that is, P40=0.512P50 (P stands for the shaft power of the motor). 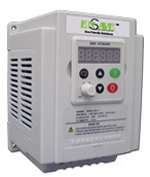 As shown above, if the Ensave B500Y is used for flow (air quantity) control, a large volume of electric energy can be saved. 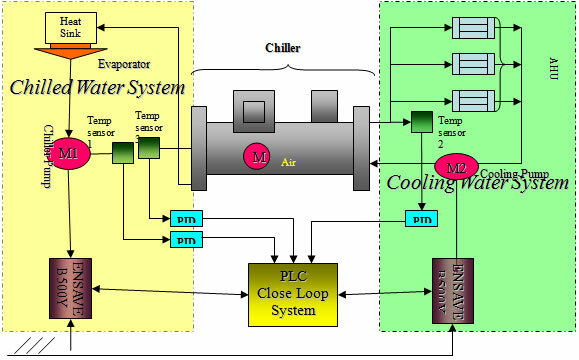 During the design of a central air conditioning system, consideration is given to the maximum on-site cooling capacity requirement. Its chilled water pump and cooling water pump are considered according to the maximum operating conditions of a single piece of equipment. In actual application, the chilled water pump and cooling water pump operate in a non-full load state at over 90% of the time. The regulation with valves and automatic valves not only increases the flow control loss of the system, but also causes the operation of the entire air conditioning system at fluctuation state due to staged regulation. However, if the Ensave B500Y is added to the cooling water pump and chilled water pump, the problem can be solved permanently, and furthermore, automatic control can be implemented, and investment can be returned by the use of the Ensave B500Y for energy saving. Furthermore, the soft start function and smooth regulation feature of the Ensave B500Y can stabilizes the regulation and operating state of the system, and prolong the service life of the unit and network management system. Therefore, the air conditioning system whose water flow varies with the heat load can perform more efficiently in terms of energy saving. The use of Ensave B500Y to regulate the rotation speed of pumps can conveniently regulate the water flow. Through PID regulation, the feedback signal that varies with the load and the Ensave B500Y form a closed loop control system, so that the rotation speed of the pump can vary with the load to save energy. Normally, the energy-saving rate is over 15%. The energy-saving rate in the building is closely related to the usage by the user. Normally, the energy-saving rate is higher in the cooling environment (over 20%), while the energy-saving space is limited in the hotter environment due to the greater demand of users for electric power (normally 12%). Copyright � 2019 Ebeam Sdn Bhd. All Rights Reserved. Powered by OrangeSoft Design.